I just got back from the most wonderful retreat with my Sew Bee It quilting bee. 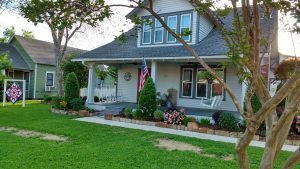 It was our first stay at “And Sew It Began-Pieceful Stitches” in LaPorte, Texas, and it is a fabulous place to retreat. Ronda Stockton, the owner, could host her own remodeling and decorating TV show. The house is a beautifully refurbished 1913 Sears kit house that will sleep 16. There are quilts and special touches in every room. The large craft room is behind the house and has a bathroom and kitchen area. There are tables for 16 people and a cutting and ironing station. And to top it all off, there is an on-site quilt shop. 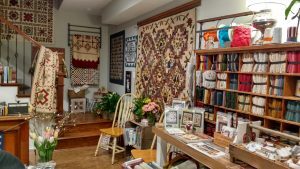 The shop is not large, but Ronda has managed to fill it with a good selection of fabric, books, patterns and quilting notions. And even better, if we needed something after hours, she gave us a key to the shop and we were allowed to cut fabric or buy supplies and then just leave a note for her. One of the most fun parts of the retreat was being in a quilt shop in our pajamas. If your sewing or crafting group is looking for a place for your next retreat, I highly recommend “And Sew It Began-Pieceful Stitches”.